It is always a bit amazing how many people are eager to receive ashes. You wouldn’t think that we need or are eager to hear reminders of mortality. After all, we get those all the time. Loved ones die. Our own bodies show signs of wear. We are in the midst of broken situations and broken communities, and we never have to look far to see decay and corruption. Lutheran theology speaks of sacraments as an act, instituted by God, where the Lord’s promise (of forgiveness, redemption, eternal life) is joined to a visible element. I suppose that the ashes of repentance cannot truly be sacramental because their imposition is not commanded by God in either Old or New Testaments. But the puzzle of people’s eagerness to receive ashes makes more sense in light of sacramental theology. It must be said that there is grace in truth. Despite the many reminders of mortality which surround us, we also live in a culture of denial. “Remember that you are dust, and to dust you shall return” simply puts the truth on the table. It is a awesome, if unwelcome, starting point for a relationship with God’s grace. And it must also be said that this recognition of mortality is only the tip of the iceberg. I strongly believe that those who seek to hear this word on Ash Wednesday have also heard and hold in mind the abundant Word of God’s promise. In the light of Christ, in the hope of Christ, our mortality is not something to be feared or denied. In fact, mortality, with its inevitable suffering, is something we share with every one of our human brothers and sisters. While we might think of mortality in connection with the isolation of loss, the dust we share can be a point of connection. We are not at our best, we are not at our most glorious, we are not most fully human only when things are going well and we are lost in the rapture of joy. We may also be at our best precisely when things are at their worst. How we respond to suffering, disaster, and death can be just as glorious as our best hymn-singing. Yet we cannot do it as individual specks of dust. The breath of God which gives us life, also blows us dust motes together, into holy “dust bunnies.” Dust is looking better all the time – when it is joined to God’s promise that even dust can be holy stuff. thank you for this. 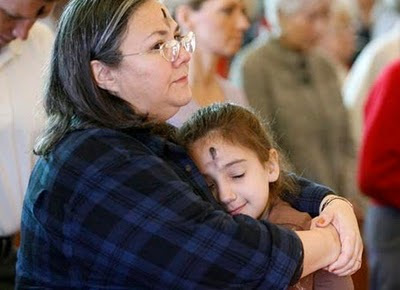 i missed ash wednesday worship today because i'm not well & was feeling sad about that. your piece was just what i needed. i shall reflect on it & allow God to speak though it. Thanks, Joseph. Our church was out this morning, as usual, at the local commuter station, offering ashes and the opportunity to remember that this day, like all the others, is a good day to return to the Lord. What started out as a bright spring day turned unexpectedly chilly and windy. And it was wonderful and awe-inspiring, to see people turn around to be touched by faith, to have a moment of grace in an unexpected place. May God be with you always.